Having lighting in our swimming pool will allow us to enjoy long baths during those warm summer nights. A swimming pool can be build in the middle of a beautiful garden, surrounded by shrubs and colorful flowers, perhaps a modern form and its water always impeccable, but one thing is certain: If the pool lighting is poor or has none, it will never be in all its splendor on nights that could have if one is adequately illuminated. New technological products such as fiber optics or LEDs are entering with force in the landscaping and outdoor decoration market. 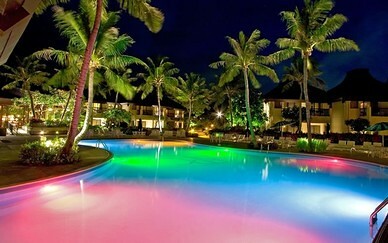 This technology is being used in polychromatic illumination of gardens, terraces and swimming pools. There are various types of swimming pool lighting systems, so we will talk about the best-known, traditional halogen lamps (they can go outside or inside of the pool), fiber optics, led lighting, and finally floating lamps. Swimming pools illuminated by fiber-optic lighting system offers all the guarantees of security and benefits of the colourful lighting applications. With fiber optics there is neither heat nor electricity in the wires; Therefore, the maintenance of the fixed lenses under water is removed. 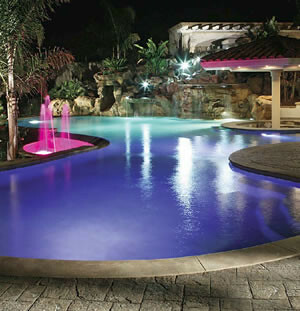 With this system you can fully illuminate around the perimeter of the pool and in various colors. 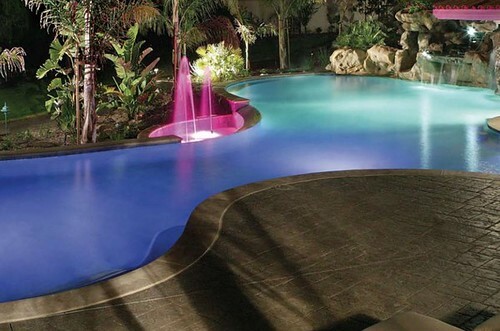 The led lighting system provides the desired color setting in every moment for your pool. It is formed by the LED projector, the remote control, a terminal receiver and a transformer which is supplied separately. LEDs projectors for swimming pools have been designed to operate entirely submerged in fresh water. They should be installed about 40/50 cm from the edge of the pool to easily access for spare parts and general maintenance. These devices work at low voltage, within the safety limits of 12 volt AC. Floating and flexible lamps models can be used not only in the pool but also in ponds, lakes, gardens and terraces. They generate different effects according to the chosen tone and the color of the water in your pool. 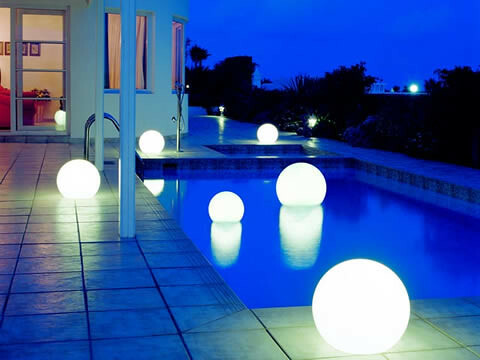 Its water repellent material prevents moisture or leaks, maintain the balance on the water creating a stunning set of floating lights. They also have a battery that lasts without recharging it at every moment. They are also of polyethylene, allowing you to isolate electricity without any risk of electric shock. 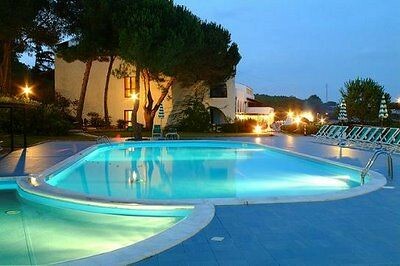 Halogen lamps, the most ancient and known by all type of lighting can be installed both in the pool. Halogen lamps or incandescent light bulbs can be used in the pool, under the water surface. This is a convenient way for swimmers to clearly see the marks when they swim during the hours of darkness. 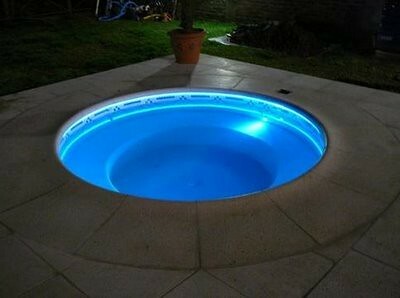 In general, experts recommend the fiberglass lighting system for our swimming pool, which, despite being the most expensive, is the one that has greater performance and security.